At Shelving4Shops we buy and sell used shop shelving and equipment, so if you are on a tight budget, or simply having a refit and need to sell your used shelving and store fixtures we can help. We supply a wide range of new and used supermarket shelving and second hand shop fittings from our large warehouse facility in the Midlands. Shelving4Shops specialise in the removal of large quantities of used shop shelving from some of the biggest supermarkets, as well as small convenience stores around the country. We have an experienced team on standby to dismantle and remove shelving and fixtures fast and safely in a time scale to suit you. Whether you have a 30,000 square foot supermarket with an eight hour time scale, or a smaller convenience store, we will work with you every step of the way. Buying used shop shelving can be one way of saving you money, although it does depend on the size and availability of the shelving required. Used supermarket shelving tends to be deep in size and more often than not is too large for the smaller convenience stores where floor space is at a premium. They can also be costly to fill with stock, so planning your shop is very important. We stock most types of used shelving but the most popular and sought after is the Tegometall brand. 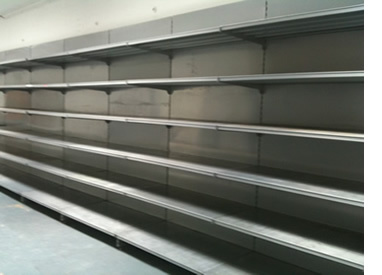 We normally have a good supply of both used wall shelving and gondola shelving units in stock. We also sell new shop shelving, and as we are direct suppliers and hold large stocks of shelving, we can pass on the savings. This means the price difference between new and used shelving can sometimes be very little so comparing prices is advisable. When buying new shelving you can always guarantee you will get exactly what you need without having to compromise by using the wrong size shelves for the shop. Also, as we hold it all in stock we can offer a fast turnaround and next day dispatch on most shelving items and shop fittings. Delivery or collection available, we can arrange delivery across the whole of the UK from London / Cardiff / Leeds / Manchester / Birmingham / Bradford / Bristol / Sheffield / Leicester / Coventry / Milton Keynes.